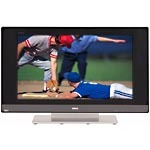 This 32" TV features side A/V inputs for easier connection of a camcorder, game console or other components, so you don't have to rummage behind your TV to find a connection. Built-in ATSC and NTSC tuners for access to both digital and analog over-the-air programming. Note: Digital content, regardless of broadcast resolution, will be displayed at standard-definition (480i) screen resolution.